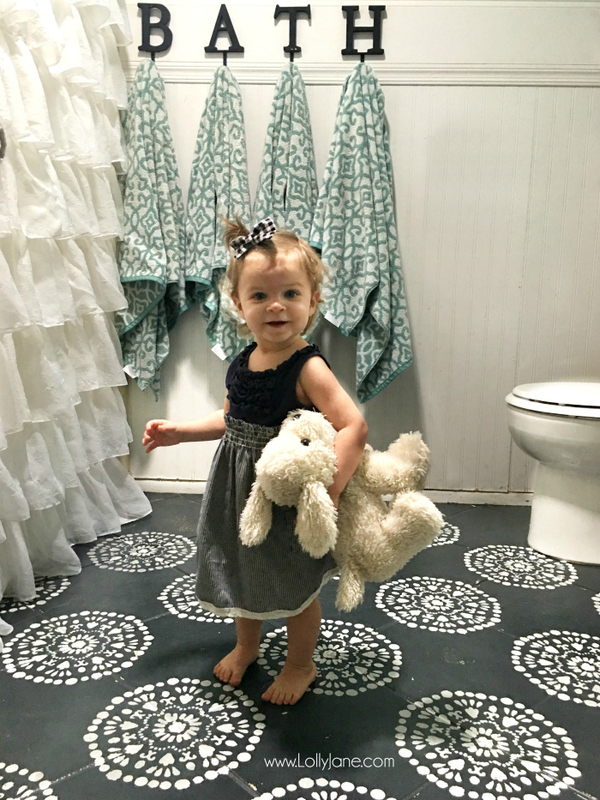 Check out how easy it is to chalk paint your tile Floors! 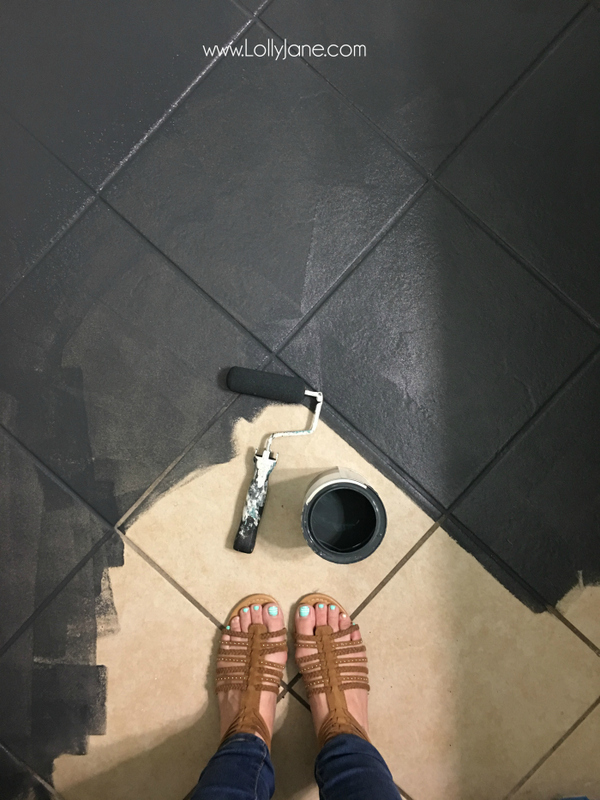 Transform your tile floors from blah to ooh la lah using a couple pints of paint and some sealer! What a transformation! I did it. 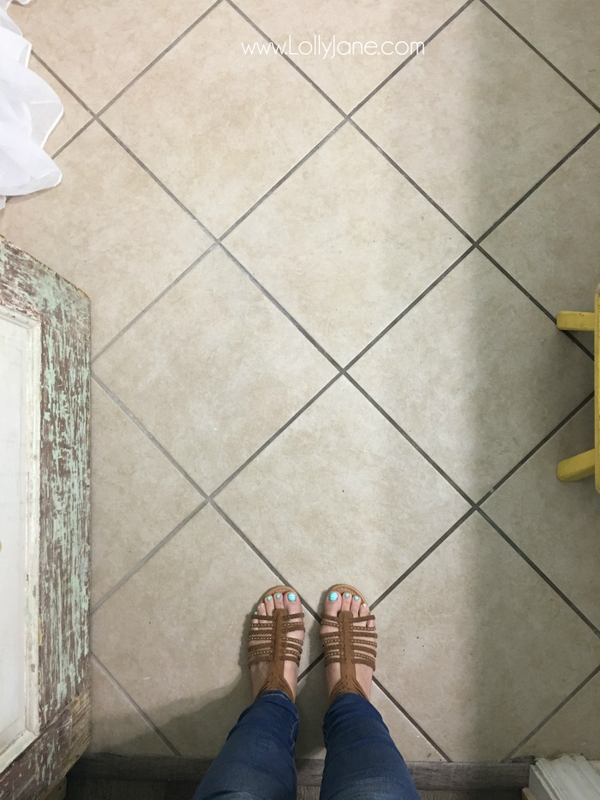 I chalk painted my tile floors. WHAT!? I know, I’m a pretty brave DIY’er but I was (secretly) a little nervous how it would turn out. ESPECIALLY since we were live documenting the whole process via 130k thousand of you via Instagram 🙂 SO glad it turned out just as expected, maybe a little better. Okay, a LOT better. I LOVE it. I’m not a black decor lover typically so going for black was a little out of my league BUT I do love classic basics and think it’s the perfect base in there. I can’t believe how big of a difference it makes and I can belive it cost me less than $50 and I can’t believe I didn’t paint my bathroom tile floors FIVE years ago when we moved it. Don’t be a wussy like me—go for it. Here’s the before tile, basic and pretty dull. Our little farmhouse has been a rental property for 30 years so it’s had basic grade everything. We’ve been trying to add some charm and custom touches over the past 4 years, being renting ourselves. We purchased the home from my parents last year and are so excited to tackle some big renovations as almost everything is original. First I painted the countertops a faux granite, stenciled the walls, added some molding to the mirror, added a new light and finished off the beadboard walls, added some mason jar bathroom storage and recently, chalk painted the countertops since the faux paint eventually wore down in some spots. When I got the itch to paint, I ran to Home Depot and grabbed three things: Black Chalk Paint, White Chalk Paint and Minwax Polyacrylic. I used an angle brush for the corners and a basic roller for the rest. I washed and used the same brush but threw away the rollers after each use. You’ll be surprised how little paint and poly you actually use! Which is why we love us some chalk paint! It goes on thicker which allows for less coats and it dries faster to save you time. Pin this image to refer back to when you’re ready to start! We grabbed our stencil at Walmart, it’s a doily style from Waverly. 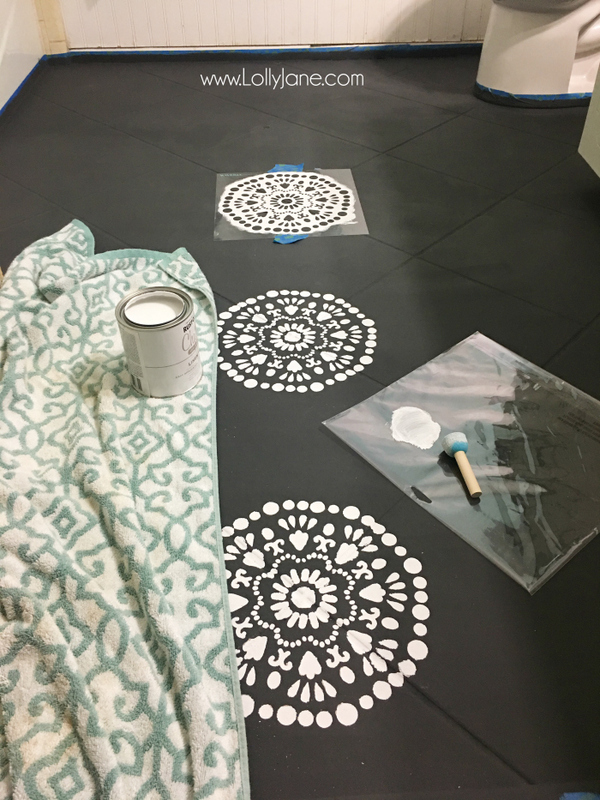 DecoArt makes a cute stencil too that you can grab on Amazon. This post contains affiliate links. When you make a purchase after clicking an affiliate link, I will earn a small commission at no additional cost to you. I am disclosing this in accordance with the Federal Trade Commission’s 16 CFR, Part 255: “Guides Concerning the Use of Endorsements and Testimonials in Advertising.” I only recommend products that I personally use and genuinely recommend. Thank you for your support! How to paint your tile floors. Here’s the flooring after one coat, keep going! When I finished the second coat, I let it dry for a couple of hours, in between running errands and housework. After the kids went to bed and I turned Netflix on, I tackled the stencil. 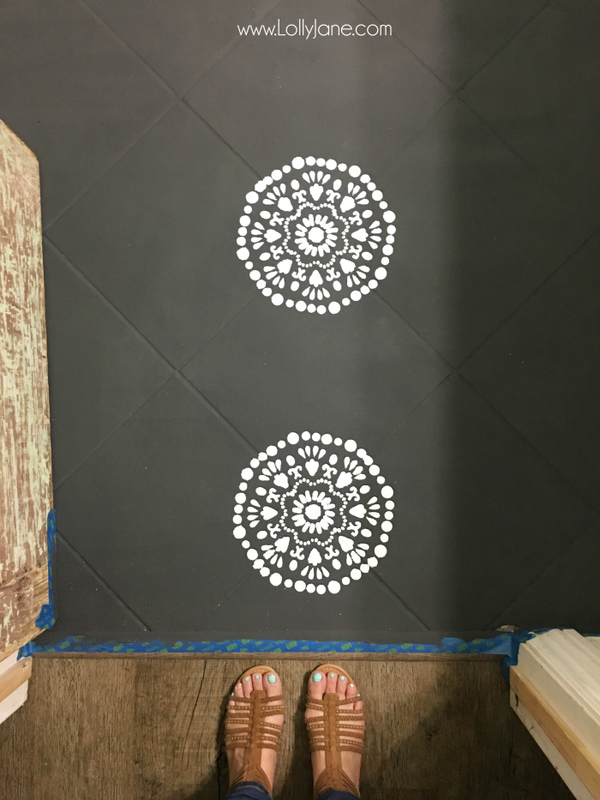 Kristi and I decided to stencil in the grout lines, starting at the center of each. I placed it in the middle then dabbed the white on with a foam stencil brush. It took me about 2 hours total to stencil the bathroom tiles. A couple of tips: stencil in one even coat. As soon as it was fully coated, I removed the stencil and moved on. I didn’t want to try to line it up a second time and have it smudge. We’ve worked with stencils a lot, they’re pretty forgiving. I’m definitely not a perfectionist, they came out pretty clean and crisp without wiping off the back of the stencil in between. The stencil dries really fast since it’s a small amount of paint. I used my hand sander and went over the middle of each stencil and in between them too to “grunge” it up a little. This is optional but I didn’t like how stark the contrast was so it toned it down a little bit. It’s also a good way to camouflage potential future scratches or nicks. I rolled on 3 coats of Minwax Polyacrylic to seal it. It requires 2 hours of dry time in between so I applied the first two and just to be extra safe, the last coat I applied pretty heavily then let it dry overnight. It looks great! DEFINITELY better than the before! A super affordable way to update your flooring without spending thousands of dollars. I loooooove my vinyl flooring that you can see peeking in the bottom of this picture. It’s waterproof and sturdy as all get out! Our police dog knocked over a whole gallon of paint on it in my craft room a month after the install…I let it dry for a few days then literally peeled it off in one pull. Amazing. 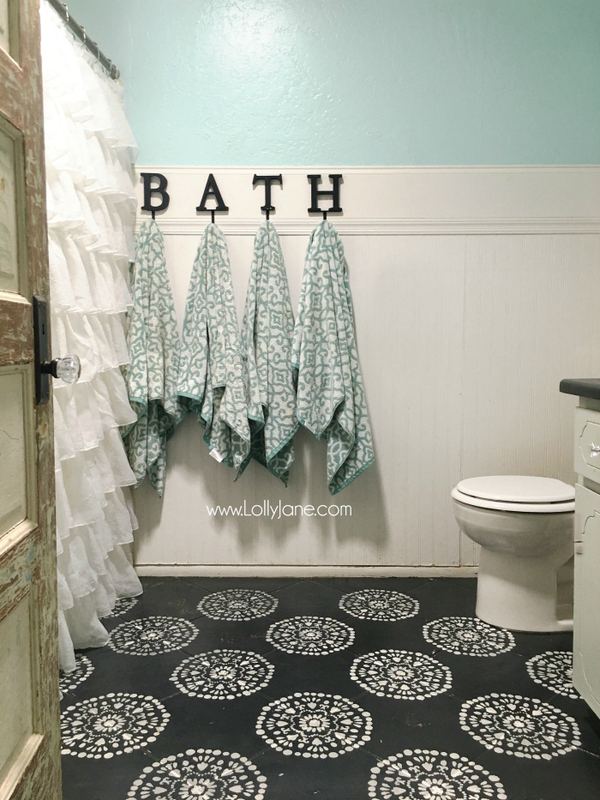 But I love the pattern in a small space like a bathroom so my new bathroom flooring will be a pretty ceramic tile…one day! PS: This cute little lady’s daddy installed a solar tube for me! I love the natural light it offers all day!! More on that later! LIFE C H A N G I N G.
Please pin so your friends can paint some tile too! Check back next week for the rest of this mini-makeover, we love the thrifted cabinet we created! This hides everything! Especially because I sanded it. Give it a try! How has it held up with wear ? Had it peeled? Hi Tracy! It’s held up great and 4 kids use this space daily! I purposely distressed it to help camouflage the wear & tear but other than a few scuffs the sealer is doing its job well and the paint is holding nicely. 🙂 I am really happy with it! I just did this and am curious the wear and if you wish you had done porch floor paint…can you email me since I don’t know that I will see this response? What kind of prep work did you do before painting? I really would like to do this, but want to save myself the heartache of it not having staying power because I didn’t prep properly. Thanks in advance! Hi Deb! We cleaned it really well was all but if you want to do extra prep, you can sand the tile beforehand after you clean it really well, wipe it down again with soap and water then proceed. You can also primer it before you stencil as well. Happy painting! Hello, where did you get the stencil? I’m contemplating doing our laundry area but I’m terrified it will feel sticky and that it will show tread marks from shoes… any issues with this ? Hi Melissa! You’ll LOVE the after!! I adored it in my bathroom with very high traffic, 4 kids shared the bathroom and we never had an issue 🙂 Happy painting! I love DIY but am now confined to a wheel chair a good deal of the time, how will the make over with chalk paint hold up with a wheel chair running over it all the time! I think you have lovely toes. This sure came out cute! I love that you started with black and stenciled with white. Such a great contrast for the rest of the room! Thanks, Randi, we love it! hey girls- this looks so good! Great idea! Oh boy, Oh boy, Oh boy!I have horrid tile in the kitchen and dining room and have been wondering if I could paint them! Oh boy, Oh boy, Oh boy! Do it! You’ll love it!! Tile transformation is just awesome. You did a great job. 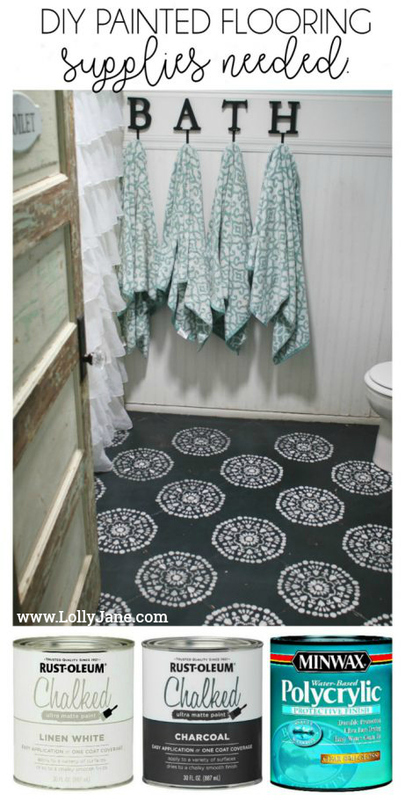 I liked this chalk paint tile floors tutorial, it’s very simple. Thanks for sharing this post. I love this idea and i seems easy enough to do! We have ugly tiles similar to this in both of our bathrooms and its not in the budget to replace, yet. I pinned this to try to convince the hubby to let me try! Oh – I do want to ask – any problem with the floor being very slippery after the poly? It does look great, nice job and thanks for sharing. I hate the tile in my motor home so this would be perfect! YES! This is the perfect paint for that project! Get out, this is the best idea ever!!!! Hi….thanks for sharing at Inspire Me Monday. I wanted to let you know that you are one of my featured links this week. Come by and check it out. http://www.farmhouse40.com/inspire-me-monday-134 See you soon! I love this idea. 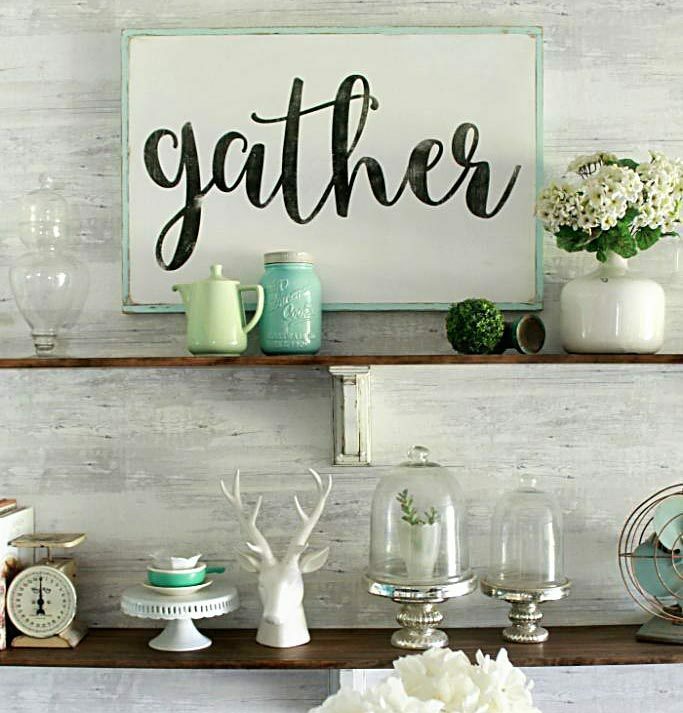 Its good to know you can paint on vinyl with chalk paint. The bathroom update looks really really good. WOW! This is awesome!! 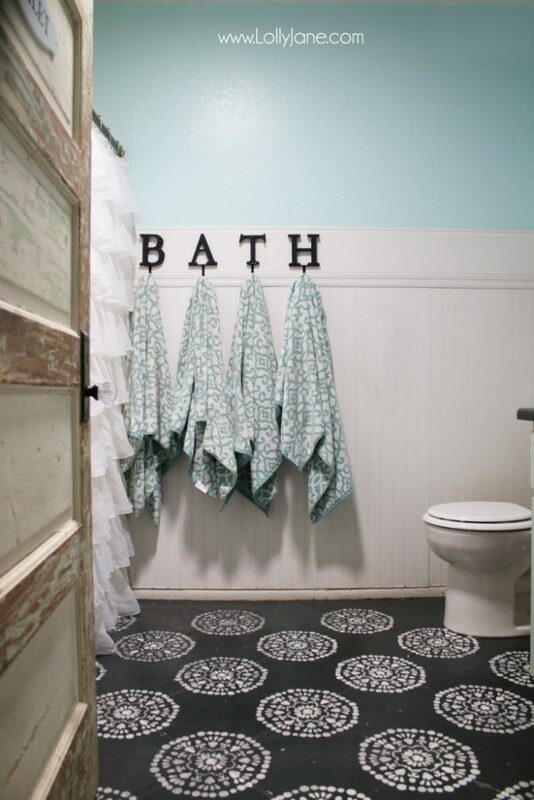 I wish my boyfriend would let me do this to our bathroom, I love it! I’m thinking though maybe a few decorative tiles on a wall art piece, or out in the yard. How has it held up so far? I chalk painted a backsplash in the kitchen, and use it as a chalk board. It’s been a few years and it’s held up well without being sealed, but it’s just a backsplash, not a trafficked floor. Well shut that front door girls. Love this and have ceramic tile would love to banish but would be happy to disguise. Would have to get it done before bed as need to visit bathroom at least once a night, other bathroom at other end of house, would never make it in time, my old legs aren’t that quick. And whose little sweetie is that with her baby under her arm, so adorable. So lucky to have her, so precious. What does she think of floor? We have a front entry that is enclosed and has ugly green tile. I tried covering much of it with an outdoor rug, but it still peeks at me. Lol. I want to do this! How does it hold up with traffic? Any scratches or areas where the paint has chipped or worn off? It’s been great so far! 4 kids, a crazy dog, daily swimsuit changes in there and it’s holding up like a champ! 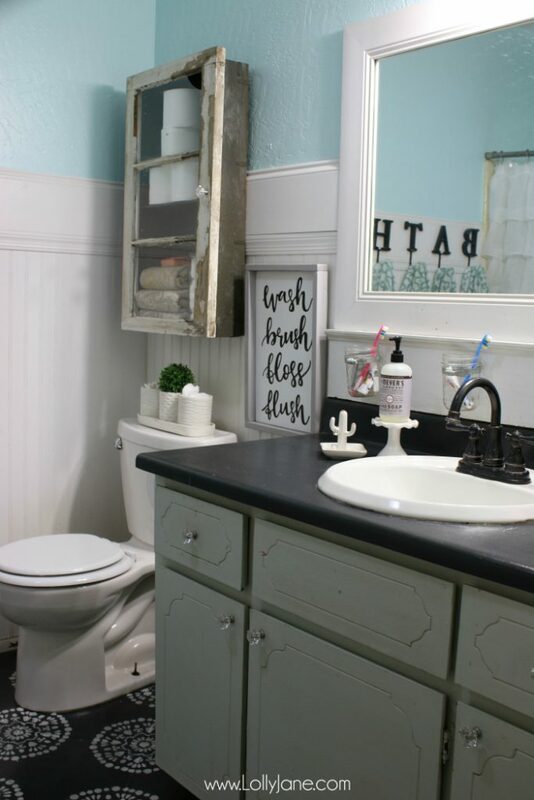 Love it and want to try but am wondering how you did the partial stencil at the edges, like near the vanity, toilet and tub? I’m a novice at stenciling so sorry if I’m asking a very basic question! Will you be doing a tutorial for how you painted the awesome door???!! I’m wondering if you used a water based or oil based poly? I’ve heard that when water based poly gets wet it turns the original milky color? Have you noticed any of that? And what sheen did you get? A semi-gloss or matte? You’ve inspired me to paint the bathroom floors this weekend and was just curious about these last little details. Good luck, girl! Whoo hoo! I didn’t do any main prep other than washing it really well. It was fun to paint!! Quick question, did you sand or not the tile, below this answer you said you did. I did the first coat of paint and I can remove the paint easy, would the poly take care of this? Hi Raul, I did do a light sanding but the sealer works wonders too! What do you clean it with? Can you use normal cleaners like Mr. Clean etc? Did you sand the tile down a little so the paint would adhere or wash it with tsp? This is an excellent idea. Any update on how well it withstands water/moisture? That is my only concern about using it in a bathroom. I have painted shower tile with a “refinishing kit” before only to have it flake off after normal wear. I’d love to hear your thoughts! Hi Amanda! The floors have held up great so far…the countertops have not, however. We sealed them 3-4 x’s but honestly, this is a temporary fix for us. Lots of people have had great success but I wouldn’t look at it as a long term solution, personally. Silly question, but do you apply the dealer the same way as the paint? I.e. Put in a try and roll it on? Love it! I have white tile that I hate! What kind of prep work did you do and do you have a tutorial on how you did the countertop? Has it held up well? Any chipped off paint? I’m a DIYr too and I’d go for this in a heartbeat. I have experienced chipped off paint after doing all steps in chalk painting my kitchen cabinets and I even polyed them just for a precaution and It wasn’t a necessary step. Hi Pam, we did this as a temporary solution. So far they’ve held up well but there definitely is chipping. If you’re looking for a low maintenance route, I wouldn’t paint your floors. They’ll eventually peel up over time, I suspect. Can I do this on ceramic floor tiles ? I see you had vinyl tile but I have ceramic in my powder room. Hi Helen! They’re actually ceramic so yes, you absolutely can! why chaulk paint ? I always thought that was for distressing furniture. can it be cleaned repeatedly and not chip or come up? Chalk paint is great because it’s a shortcut paint with the added chalk, it takes away the need to prep or Kilz as it adheres well to any surface. Sealing is key to prevent chipping. I feel like it’ll peel over time but this is a great temporary solution. How has it held up over time? Thanks. Hi Cindy, it’s definitely chipped in major use areas. I painted my bathroom floor as well, it held up to a family of four with tons of company and pets. I also used polycrylic so it wouldnt yellow. Every 6 onths id clean the floor real well and put on a refresh coat of poly. It lasted 12 years❤, and we only have 1 bathroom in our 1921 house. Hi can you do this inside a shower aswell? Love what you’ve done. I wonder how this would work on the old vinyl “peel and stick” squares (my yucky bathroom floor) or on linoleum (my yucky kitchen floor)? The kitchen, especially is a high traffic area. Thanks. My floor was linoleum and it held up great . I was surprised, we only have one bathroon, and its cleaned daily. I just added a new coat of poly every 6 months. It lasted 12 years. Love to hear that feedback!! Glad it’s been so durable! Hi Lisa! I use my steamer and it’s been great! A Swiffer pad is nice and soft on it too! How did you have to prep the floors before painting? I LOVE this. I painted my kitchen cabinets and now the floor just looks awful but I can’t imagine demo-ing that floor and relaying tile. We can go on top since the ceiling heights are low, we are high enough. Do you really think this would work on a LARGE kitchen/high traffic area/center of the house? Thank you in advance!! Hi Bonnie! I had that problem too- my home is a 1970’s farmhouse with original everything. I painted my cabinets and my floors now look terrible, LOL! To be honest, I don’t know how well they would hold up in a high traffic area- for less than $100 in materials it’s worth a try! I would just seal them 4-5x instead of 3 like I did mine and expect a bit of distress. In fact, I distressed mine ahead of time to plan for that! 😉 Good luck!! Hi there! This looks so good, I’m probably going to try something similar to cover up my heinous light beige tiles that show every single water drop 🙁 How many months did it go before it started chipping? The loo I want it for is moderately used and I’m trying to figure out if I should invest in a primer step or not. Thank you! Hi, it held up great for about 3 months. After that you’ll need to touch up! Good luck! I did it! I took ugly beige and changed it to a dark gray to match the wall tiles that I recently had resurfaced in the bathroom. Almost the same before and after colors as yours. When you touch up the floor, do you re-paint the whole square/tile or can you just paint over the chip and re-poly that small section? With the 2 different finishes, I’m concerned that it will look “frankenstein-ish.” Thanks! So I painted my floors and did one coat of poly and it left white marks? Did I not let the chalk paint cure long enough or did I put the poly to heavy? Help!!!! Hi Jennifer! The poly acrylic will have a milky look but dries clear. Did you use the same brand as we recommended? You can’t sand ceramic tiles. Needs a grinder. Husband used to be in floor treatment business. So it’s unclear what prep was actually given. Also why was chalk paint used? This comes off wooden furniture if you wipe it down before it’s had its wax seal. I’ve used chalk paint before. This whole pin just doesn’t add up. Why not use a stone paint for ceramics? There’s one made by the chalk paint mfrs. 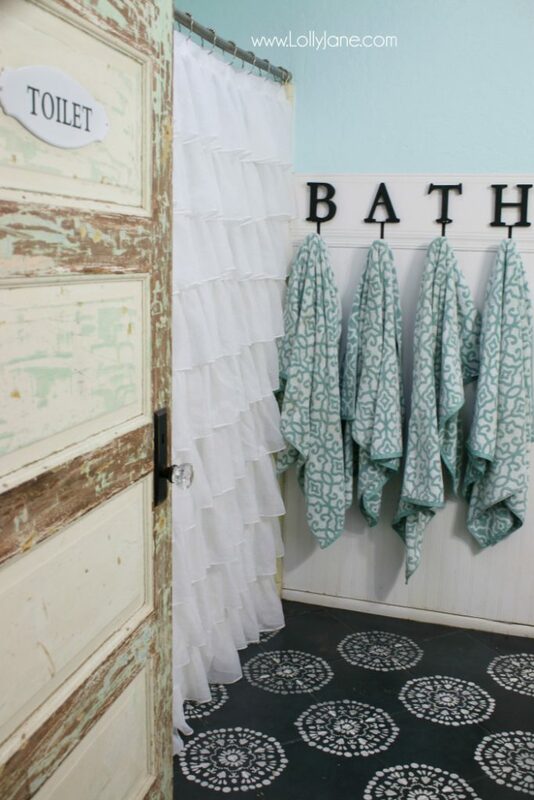 There are people who resurface your old kitchen or bathroom wall tiles – maybe that paint would be better. But all the same this pin a great idea and much cheaper than re-tiling although I’d do a bit more homework before following too closely. Hi Kate! Thanks for the info. We roughed it up enough to get the chalk paint to stick. We don’t recommend this long term but followed another tutorial who used this same paint and she had amazing results. We’ve painted our concrete porch and used concrete paint, I think that would also work? This is a short term solution for people who can’t afford to replace their tile or who don’t want to spend a lot of money. This is the perfect solution for a space with low traffic or little water access. It actually held up really well for me until I was able to afford a bathroom remodel where we gutted this whole bathroom. Anyway, we appreciate your insight and definitely recommend homeowners do their homework, this is one option of many but a trendy and affordable way to update a floor without having to replace it. Take care. This was on vinyl. Do you think I could do the same on tile? This is beautiful and charming. I am definitely going to do this to my daughter’s 1960’s black & yellow bathroom! I won’t ask my husband because he always protests my projects. I’ll just start it while he is working or sleeping ! Would this be feasible even in a small bathroom with ventilation issues? Mine gets super steamy and humid even with the fan going. We have 1 vent and it gets steamy and we didn’t have any moisture issues. We did have a few spots chip here and there depending on the shoes worn indoors. Would this work on vinyl floors? Gorgeous! Did you do anything to prep the floor first? I’m not clear on if you sanded the poly between coats or not. Love! Love! Love! Definitely on my project list for the kitchen and bathroom. Thanks for sharing! P.S. Loved how you sweetly answered the same questions that were asked repeatedly! I’m an avid DIY’er. I’m prepping my 1/2 bath as we speak! I’m so excited I could burst. My floors (burgandy WALL tiles 2×2 from 1962) beat your builder grade tiles hands down! I cannot wait to get started! It’s done and I LOVE IT!!! I have pink/tan 1965 wall tile on. I just got pale gray walls, tan, gray & smokey floor tiles. I am going to for the mideum Gray chalk paint. I can’t wait. How EXCITING!! Good luck, Judy! Hello, I’m planning on doing this in my front room coming in the front door. It’s my music studio so it will see a fair amount of traffic. My room is 221 sqft; about how long do you think a project would take for that size room? 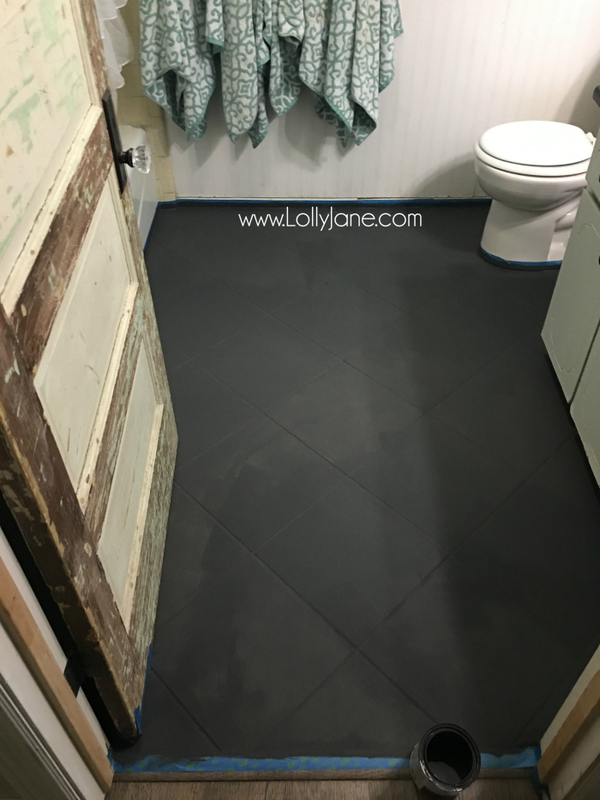 I’m not really a DIYer, but I’ve got to get rid of my ugly tan tile, and need to do it cheap. Thanks for any advice you can give this newbie! ? Hi Abigail! Oooh that will be quite the transformation and make a big statement! 🙂 It’s all about prep and sealing it to make it last as long as possible; I lightly sanded my tile so the paint would have something to adhere to and after 2 coats of paint, made sure to SEAL it really really well. If it’s high traffic, I would even add a few layers of sealant. Then, be sure to re-seal as necessary (every year or earlier if it’s really high traffic. Touch up as needed then re-seal.) Happy DIY’ing! It looks great!! 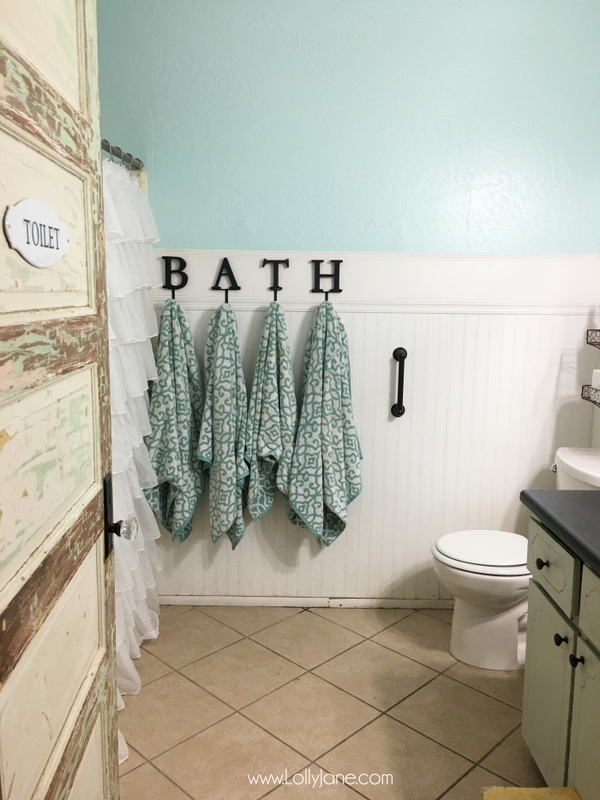 Did you have to sand the tile at all before applying the chalk paint? Thanks! I love your floors! They look awesome! 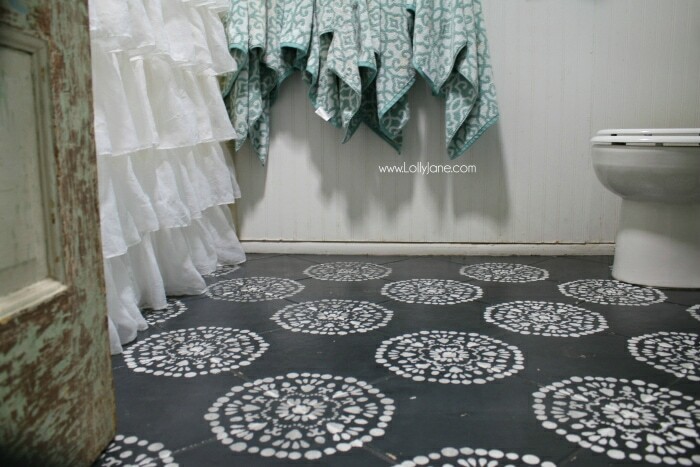 I have what may be a stupid question but can you chalk paint vinyl floor? The one in my foyer looks like marble ? and is ugly! Just hoping I can paint it! ?. Thanks!! Yes, go for it!! Vinyl would be perfect! Love love this! 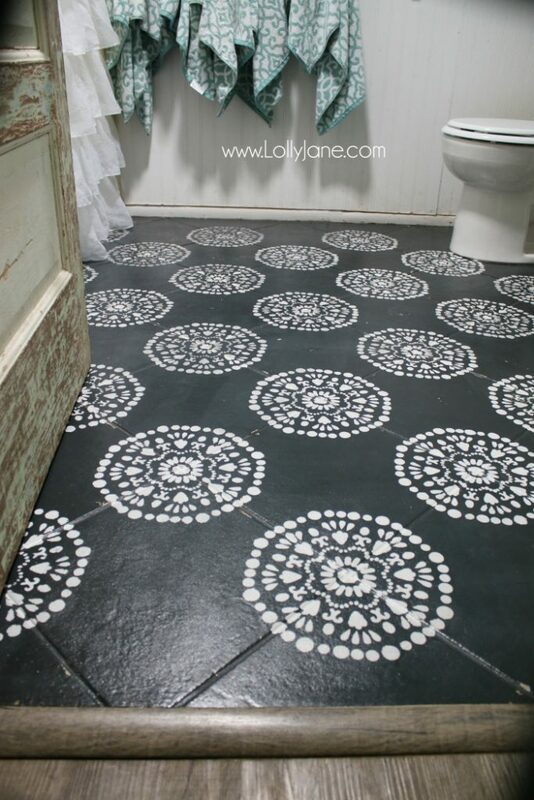 Would like to do my powder room floor. I paint in the Mackenzie-Child’s pattern and did the walls. Just not sure what color to do the floor. What did you use for a sealer? Sounds lovely! We used a poly-acrylic from Home Depot. Good luck!! Share pics when you’re done! HI, We are building an apartment over a barn and can we do this painting directly on the sub floor??? We are not looking to put a lot of money in this. I looked through several questions and through your post and I may have missed it, but can this be steamed cleaned? Hi Sherri! Yes, we have a steamer and it works great!! What a great idea, and for a fraction of the cost to replace the tile. Looks great. Looks amazing! I’m nervous! My time is uglyyyyy smaller bathroom tile. Maybe 4×4? How did you decide on the stencil? I’m wondering what would work with the tiles being smaller. And it’s help up decently for you? I’m REALLY contemplating this! You have inspired me! I just painted the tile on the floor in front my fireplace with the chalked paint listed in the post. It came out great, but I was hoping for black (since my fireplace cover is a matte black), but i found that it really looks dark grey, not black. This brand doesn’t offer black in chalked paint (only charcoal). 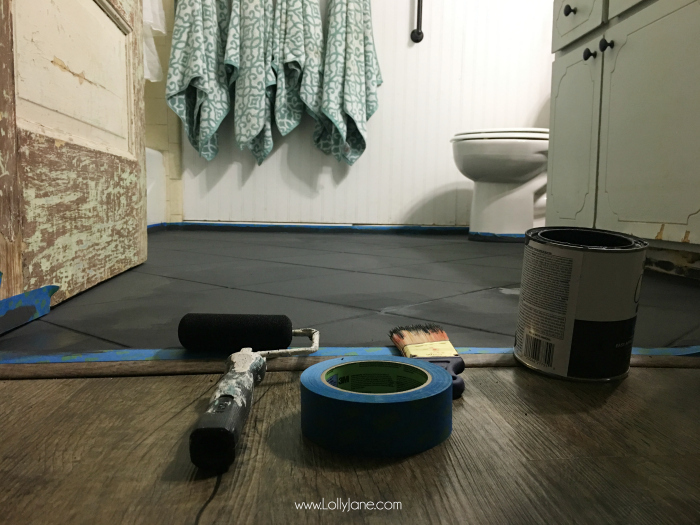 Do you think it would be ok to use Rust-Oleum chalkboard paint in black? I’m not sure if there is a big difference b/t chalked paint and chalkboard paint. I don’t want to mess it up – Thanks! What kind of sander? 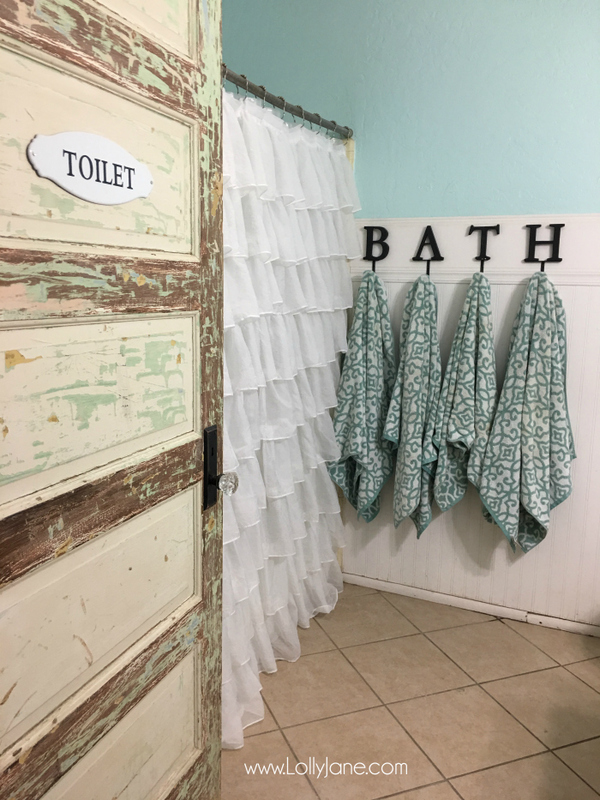 I am so excited to get started on my bathroom!Thanks so much for all the help! Love this. I plan to do a bathroom floor. I wanted to know if you have a video or page of your bathroom countertop? What kind of paint did you use? Love the so simplicity of it when buying new a new countertop or fixtures is not in the budget. Thank you for sharing. Would this technique work on bathroom and kitchen wall tiles as well? I’m thinking of repainting the backsplash along my kitchen counters along with the walls surrounding my shower. Hi Tricia! Yes, definitely! It would last much longer than floor tiles as well due to less traffic 🙂 Happy painting! Hi Lolly Jane. LOVE the floor and everything else you do! On 3/1/2018 you gave a link to https://www.viewalongtheway.com/2013/01/how-to-paint-vinyl-or-laminate-flooring/ as proof that vinyl floors can be painted. The link you mention uses a primer and latex paint. 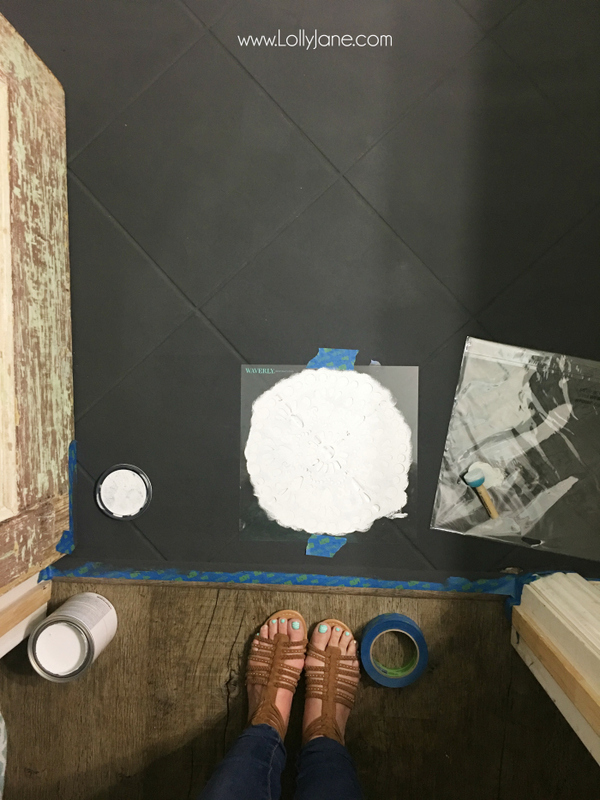 I find your chalk paint method easier and intend to use it on my worn vinyl tile kitchen and bathroom. Just subscribed to your blog too! Thanks! One of the 3 bathrooms in my 52 year old home has the original pink toilet, sink & tub plus pink oatmeal floor and wall tiles. Since I am in the midst of a major home reno I have to prioritize major expenses. 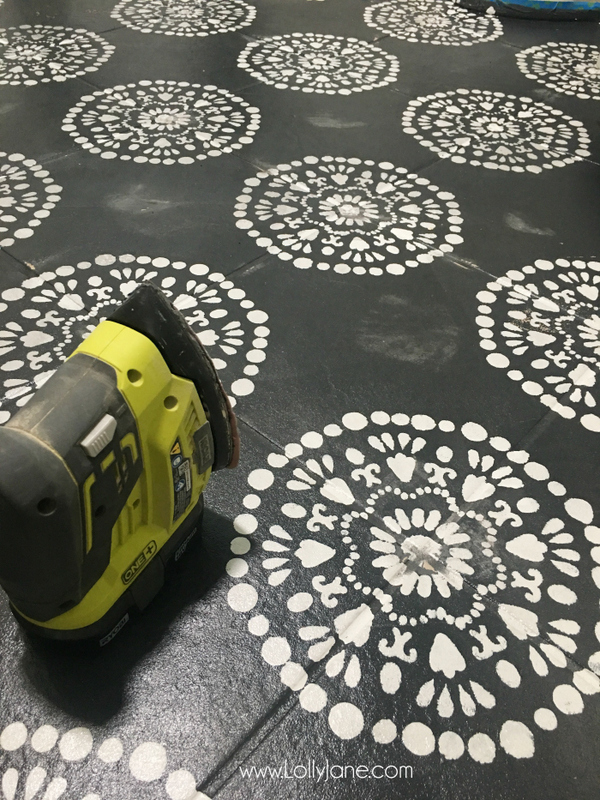 This technique will allow me to at least brighten the Arabesque floor tiles, I will probably paint them white and maybe a bit of fun via random accents. With the age of the floor tiles no reason to sand, the surface is well worn. Thank you for sharing such a thorough tutorial and for answering the exact same questions ad-naseum. I have no questions, only deep appreciation. Great idea , thanks for sharing . Hello! I’m in love with this idea. Do you think it will work on shower tile floor? Any ideas will be greatly appreciated. Tks! It’ll work on shower floors but you need to seal it really well to prevent it from sluffing off. I would recommend sanding your tile, cleaning it really well, using a concrete paint and sealing it with 3 layers.